He is good friends with Pence and Olette, and his group has a rivalry with Seifer's gang. In DiZ's Simulated Twilight Town, he was Roxas's best friend. His boredom caused him to suggest that the group take a trip to the beach (prompting DiZ and Riku to intervene, as no virtual beach existed). In the Struggle tournament, he faces Roxas in the first round and loses. 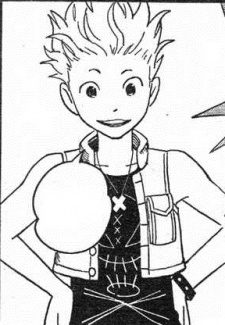 Hayner (or at least the virtual Hayner) holds loyalty and promises highly, and seen through his jealousy when he sees Roxas with Seifer and his emphasis on the promise he and Roxas made to share the winnings of the tournament. His jealousy is short-lived, though, as Seifer withdraws from the tournament and Hayner is moved up to third place, allowing him to share the winnings with Roxas. In the real Twilight Town he and his friends don't mention Roxas at all, but seem to recognize Sora slightly, because they had met Roxas in 358/2 Days. Initially, he is somewhat hostile towards Sora, presumably because he, Donald, and Goofy barged in on their usual hangout while exploring Twilight Town upon their release from stasis, and mostly refuses to talk to them because they were busy with other matters at the time. However, he warms up to them and goes to see the trio off at the train station. Hayner, Pence and Olette attempted to get into the Old Mansion when they discovered that there was an alternate Twilight Town, and they also wanted to search for Kairi, whom Hayner called "our friend too" - he was attacked by Dusks. However, he, being headstrong and street smart, along with his friends Pence and Olette, helped Sora and the gang find the way into the virtual Twilight Town. It was a tearful moment for the four of them. It had felt like they knew each other and were never going to see each other again. Hayner is also a competent fighter and is seen facing off against his rival Seifer in the finals of the Struggle competition during the ending credits. When Roxas visits Twilight Town while on vacation, he meets Hayner, who had been working on his Grandstander act, along with Olette and also Pence, whom he had already met. Hayner is initially cold towards Roxas; once Roxas proves himself by doing the Grandstander, Hayner becomes much more friendly.